They held a secret meeting in a Brooklyn living room, attended by a half-dozen other stalwarts of the Off-Broadway scene, brainstorming about how the contract would look if it were perfect. The meeting took a positive tone, and the conversation geared toward change. We researched cost of living versus trends in wages, and the 990s of the six nonprofit theaters involved. And the conversation that evening, and at a subsequent meeting several months later at the Players Club, attended by over a dozen members, kept circling back to low wages versus the high cost of living for our colleagues. Actors’ Equity Association, we later learned, was born from secret meetings at the Players Club in 1912 and 1913. Soon, a member of Actors’ Equity Association Off-Broadway negotiating committee reached out to us and arranged a meeting with Actors’ Equity staff. Three of us, prepared with facts and armed with creativity, came with answers, solutions, and rebuttals to every question, problem, and argument raised by staff members. As negotiations neared, the central committee of #FairWageOnstage gently formed, sixteen of us, meeting weekly. We internally organized to mobilize our working brothers and sisters. Our numbers swelled to a web of over 1,600 active, engaged, connected Equity members, and that list continues to grow every day. To signal our support for our negotiators, large groups of members attended negotiations between Actors’ Equity Association and the Off-Broadway League. Twenty, then fifty, then sixty, all standing and saying our names to the managers who hire us. We drafted a letter to management in hopes of better explaining our perspective as the union moved forward with negotiations. We gathered over 1,100 signatures in a few weeks, most of them written in ink, and members of the #FairWageOnstage hand-delivered the petition to the managing directors of each of the not-for-profits and over one hundred commercial producers. 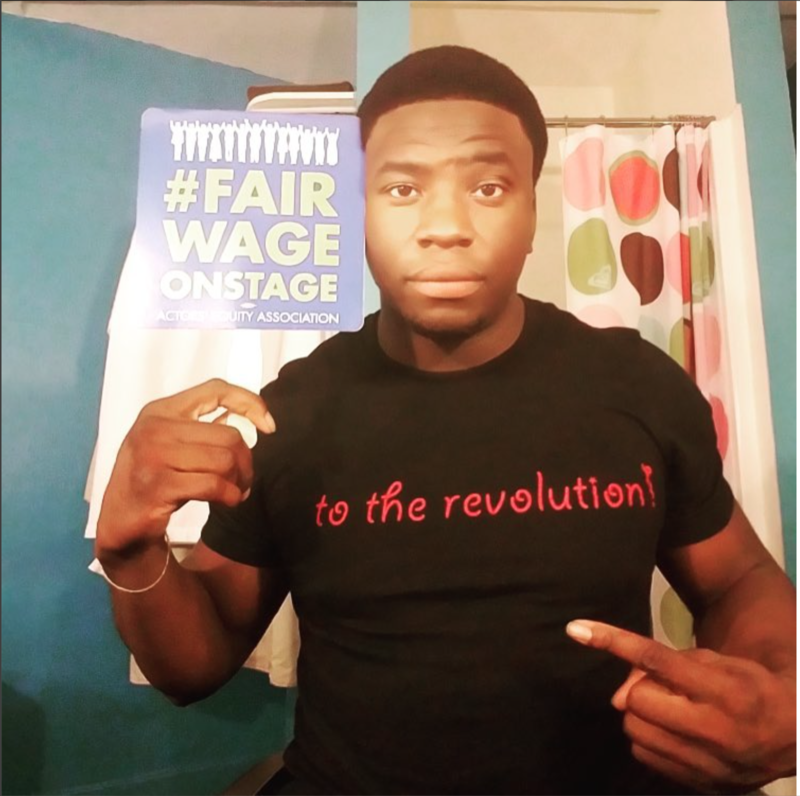 We came up with the hashtag #FairWageOnstage, as we took to social media to rally and galvanize members, to make certain our story was heard by management and artistic leadership, and to educate the public. A member designed our logo, we started Twitter and Instagram accounts and a Facebook page, and now we have crafted this site. We solicited members to contribute video testimonials in which they describe their feelings about the value of Off-Broadway theater in their artistic lives, and how they nonetheless struggle to survive on these wages in the most expensive city in the country. They represent a bench of talent as deep as it is diverse. Watch them. 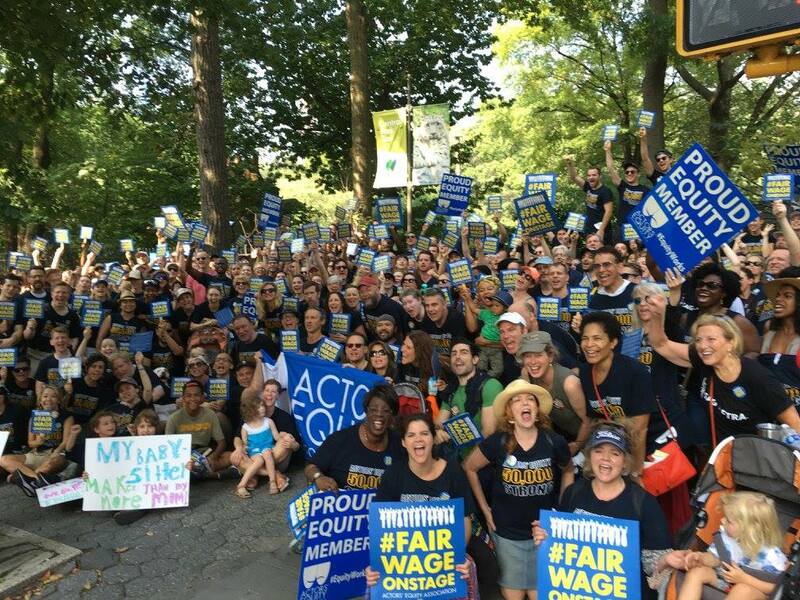 And over 300 of us marched up Fifth Avenue in Actors’ Equity Association t-shirts, chanting our slogan, “Fair Wage onstage!” Our Labor Day delegation was one of the largest at the parade, and more than tripled our previous record from last year, thanks to the support and enthusiasm our members have for this movement’s concerns. The deadline for the contract’s expiration looming, The Wall Street Journal broke the story, and The New York Times and other media outlets began covering negotiations. #FairWageOnstage continued informing and mobilizing members, offering solidarity and support. With management and the union still far apart, the two sides brought in a federal mediator and eventually agreed to a two-week extension of the contract. Our social media platforms went silent, but a major story sympathetic to the cause ran in The Guardian. 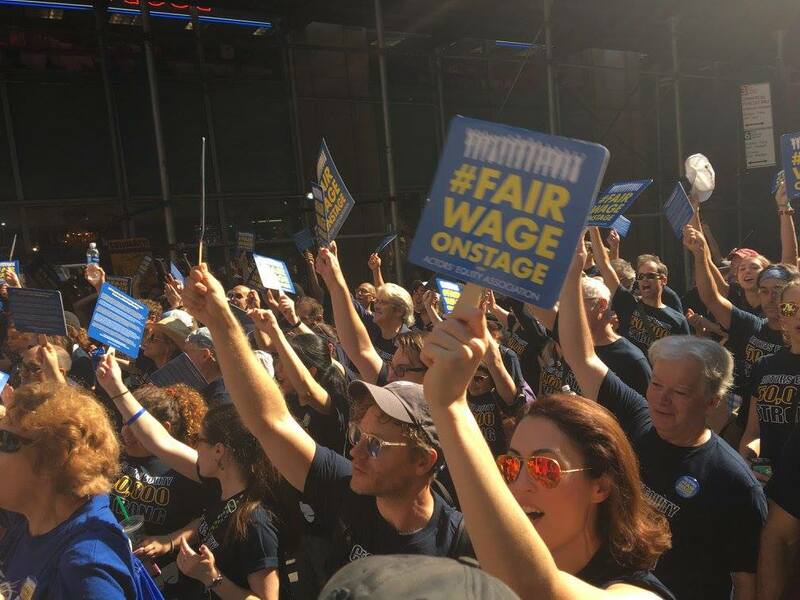 As #FairWageOnstage continued to plan for action, Equity’s negotiating committee, including founding members of #FWOS, succeeded in untangling the Off-Broadway League’s salary structure. On November 17th, we finally came to a historic agreement with our employers. 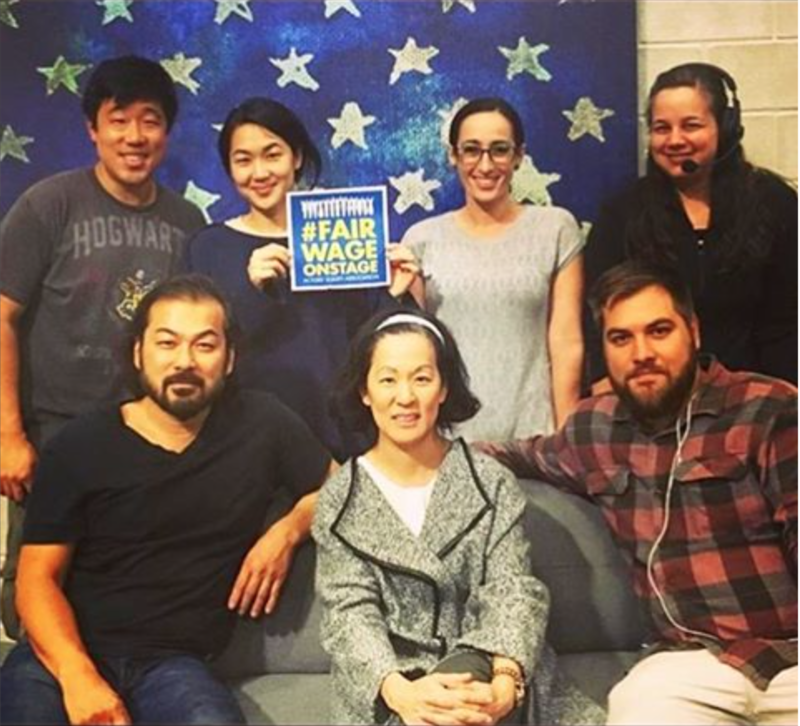 The engagement, organization, strategy, creativity, and courage of the 1,700+ members of #FairWageOnstage, working in tandem with their union, paid off with unprecedented gains in wages. 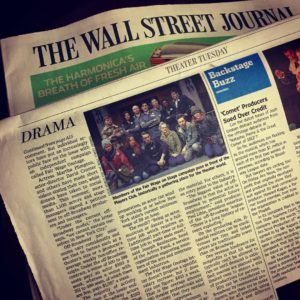 When previously we could expect to see increases of only around 2% a year, now commercial producers will raise wages by 14% over the four-and-a-half years of the new Off-Broadway contract, and Equity members in nonprofit theaters will see gains from 32% to 84% in their paychecks, all achieved with no work stoppage. WE HAVE NEVER BEEN PROUDER TO BE MEMBERS OF ACTORS’ EQUITY ASSOCIATION, NOR OF OUR BROTHERS AND SISTERS.